MOSCOW (VNS) — Vietnamese seafood products have attracted Russian customers at an international seafood exhibition in Moscow because of high demand, especially for tra fish products. Duong Ngoc Minh, deputy chairman of the Viet Nam Association of Seafood Exporters and Producers (VASEP) and general secretary of the Hung Vuong Joint Stock Company, told the Infonet that the three-day exhibition, which ended yesterday, was a good opportunity for Russian importers to seek partners in the seafood products trade following the embargo between Russia on one hand and the United States and European Union on the other. Minh said this was also a great opportunity for Asian seafood exporters like Viet Nam to increase their exports to Russia. "The ban on seafood exports from the US and the Europe has affected the Russian food market, which now needs a huge supply of seafood products from alternative sources. 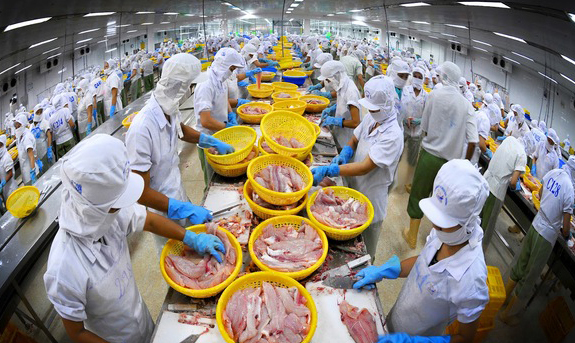 This is a chance for Viet Nam to increase its seafood exports to that market," added Minh. Russia has exploited a large volume of seafood products but does not have seafood processing facilities, so it must import processed seafood products for domestic consumption, he noted.